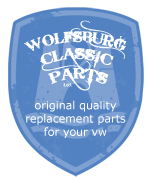 Wolfsburg Classic Parts is a new company with over 22 years experience in the VW scene so we know what you're looking for when it comes to quality reliable parts. We started WCP to supply quality products at affordable prices so you can keep your wagens on the road. Our quality control processes ensure you receive the best product available and in some instances better than original VW! We could sell you loads of parts that aren't up to the job but we won't. We are continuing to source different products that are becoming hard to find making life easier for you to maintain your pride and joy. If you have ideas for products you would like to see then please don't hesitate to get in contact with us. Email ideas@wolfsburgclassicparts.co.uk with your requests. We hope you find our website intuative and easy to navigate and you find our increasing product range useful.